Please enquire for groups with over six passengers. Include a private tour with local guide at Colosseum & Roman Forum or Vatican Museums & St Peter’s Basilica. Prices dependent on the number of travellers. Entrance tickets: we can also arrange Skip the Line tickets to Rome’s many attractions. Prices will depend on the attraction and the number of travellers. With ancient ruins waiting to be discovered, spectacular ornate churches dotting the city and art treasures adorning the walls of world-class museums, a lifetime would not be enough to uncover all the secrets of Rome. So if you only have limited time in Rome it can be hard to know where to start or what to see, let alone navigate your way through Rome’s chaotic streets. Our Private Rome Tours offer you a local insight into the unique attractions and lesser-known curiosities of the Eternal City. Our transport is comfortable and modern, so you can relax and take in the scenery while an experienced driver navigates the chaos of the Italian traffic. After pick-up from your Rome accommodation, airport or port, you’ll explore the city with your local guide, ready to uncover hidden gems. Of course, you’ll visit all the main attractions including the Colosseum, Pantheon, Piazza Navona, Vatican City, Trevi Fountain, Spanish Steps, St Peter’s Basilica, Piazza del Popolo and more. But what makes this tour so special are the sights of the city away from the regular tourist itinerary – the Appian Way, Catacombs, lesser-known Paleochristian and Catholic churches, spectacular city lookouts and many other secret locations. To tell you more would be to spoil the surprise! 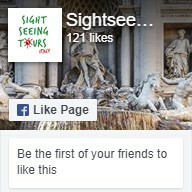 Like the look of one of our Rome tours, but want something a bit more personal? Or would you like to see somewhere we don’t visit on our regular tours? Perhaps you have a special interest that you would like covered in a tour. Whatever it is you want to do or see, we can accommodate special requests on one of our customised Rome tours. We work with knowledgeable and engaging guides and will select one to suit your itinerary and interest, so you will be sure to get the most out of your personalised tour. Enquire now to find out more about how to #digalittledeeper into the history, culture and beauty of Rome with Sightseeing Tours Italy!